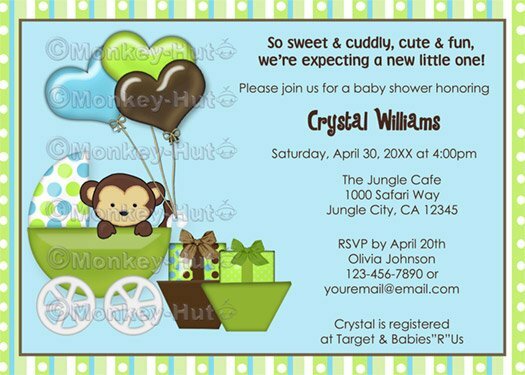 This is a perfect baby shower invitation for those that love cute little monkeys. Featuring a baby monkey in a carriage/stroller in shades of bright blue and green. (12) CHANGES if any - (colors, wording, fonts,etc.) Unless specified, invitation will follow the same format as sample shown including wording/bolding. You may also send a separate email with the above to monkeyhutdesigns@gmail.com, but please be sure to include your order#. I do get quite alot of email, so I prefer this info be included on your actual order form, so as not to miss it. I also offer several of my designs on Zazzle, where they are printed on your choice of 6 different kinds of high quality paper/card stock and each invitation comes with an envelope. I believe they even ship within 24 hours. Copyright: ©All artwork, products, and images are ©2000-2010 Connie Girga (aka Monkey-Hut). Artist retains copyright and artwork images are NOT to be reproduced in any way. All rights reserved.